Hey everyone, I play mordheim with some friends right from the beginning. At first we played every week but now we try to play once or twice a year. But some of them (I know you take a peak here now and then ) hevent really finished a warband or take a few years to paint them. 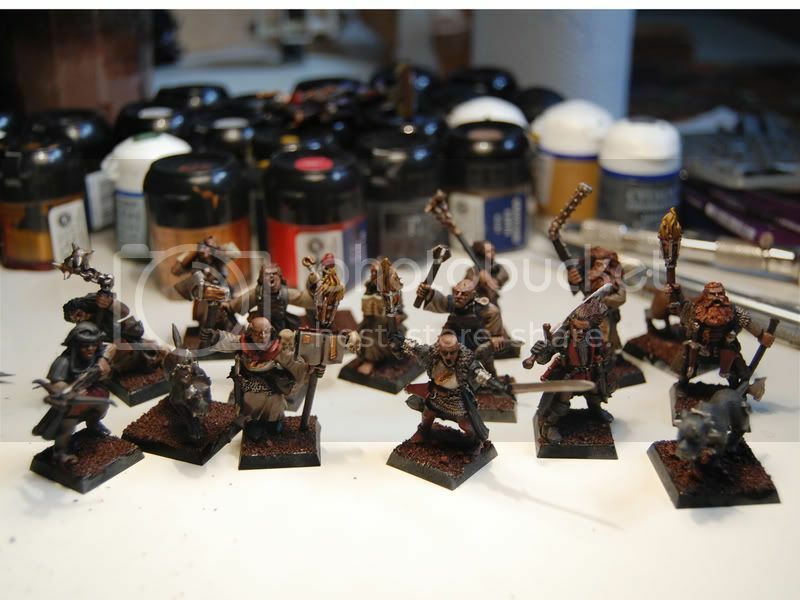 But we all wanted to have some new bands, playing 10 years with the same warband tends to become a bit boring . 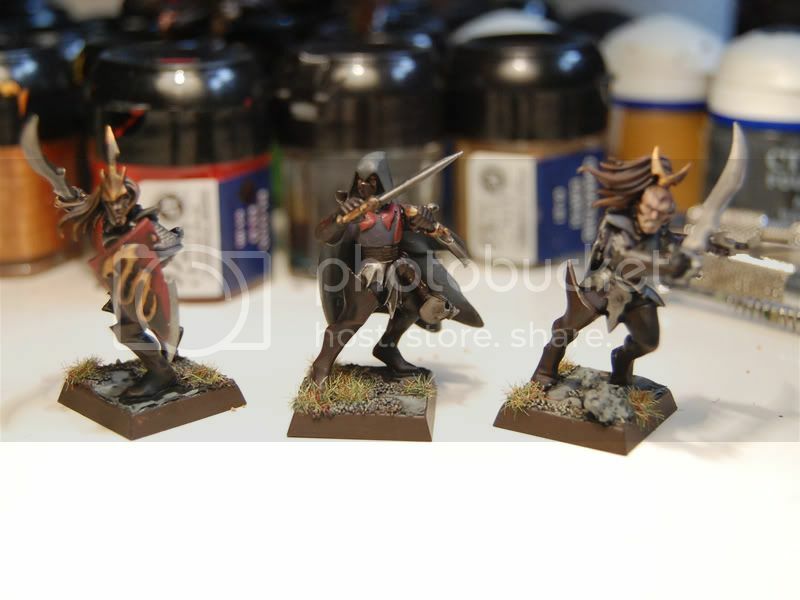 So we decided to speed paint a warband, the warband has to be painted in a day! 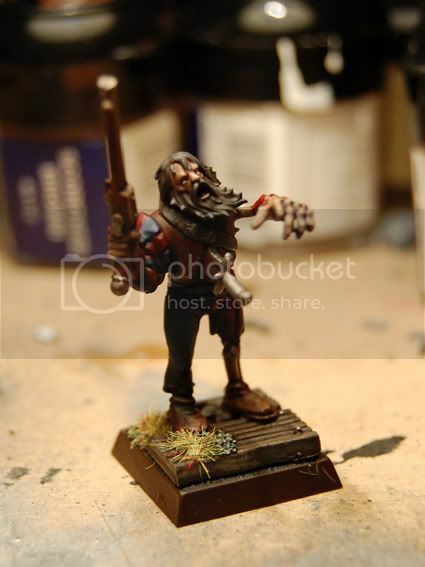 I have painted a vampire army for wfb and those regiments are painted in a day, so we gonna use that techinqe. henchmen, and a guy im going to use as a duelist or assessin. Looking forward to seeing how they turn out. If your "test" model is any indication, they're gonna look great! Are those desegrated woodelf bits? - watch out not to make admin tom angry! are you gonna bring these along come weekend? FEAR NOT; Fearless Leader Tom LOVES ALL Pointy Eared Wastrels equally NO MATTER how perverted. Back on subject: Your stuff turns out JUST SO BEAUTIFULLY regardless of the speed of production. 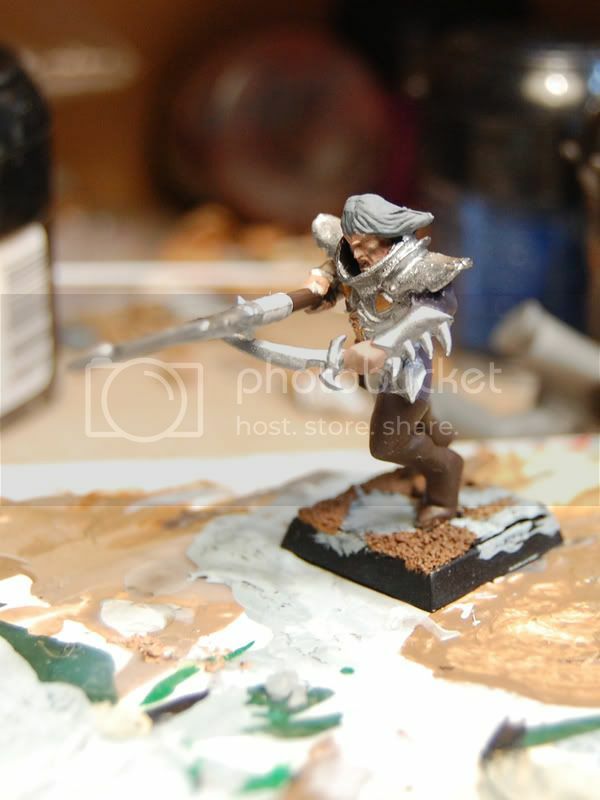 I just tend to savor the painting process, which with the cost of minis nowadays ain't a bad idea . These Guys/Gals/Thingys are going to ROCK! 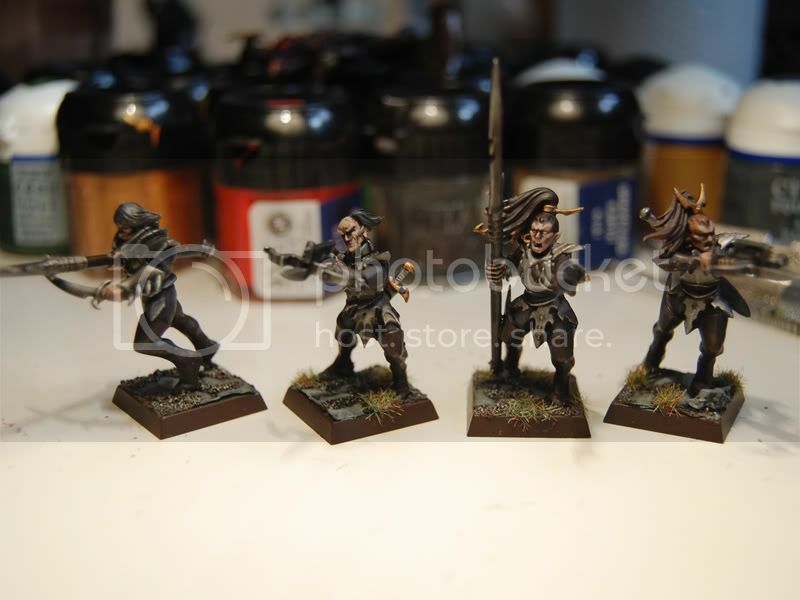 I have seen a Night Goblin army speed painted by solely using washes on white primer and mithril silver (for the metals). It looked pretty good. I'm liking the cold one beasthhounds. Nice use of sillymanders there. The assassin guy is looking good too. I may have to steal that idea. 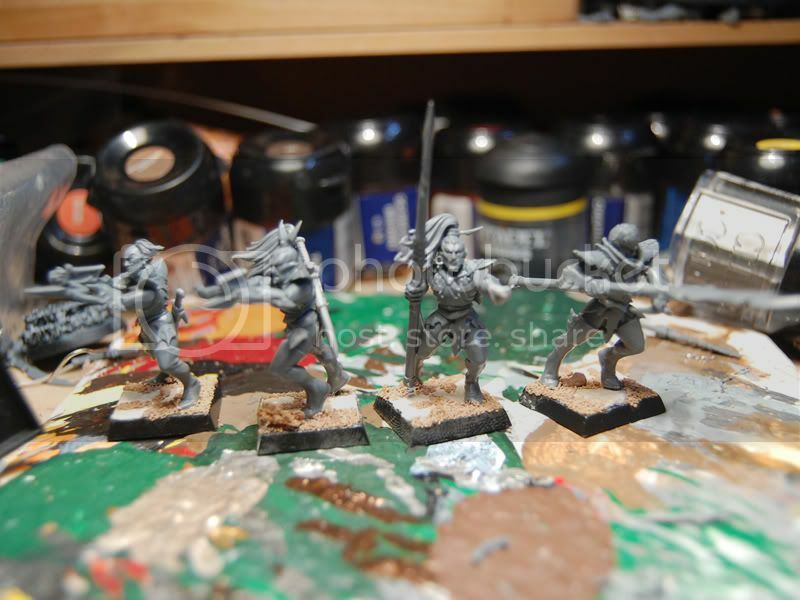 @ DeafNalla:I build this warband with leftover bits (I bought a crossair box and used their cloaks for my salamander army) and some extra stuff I got from a friend of mine. 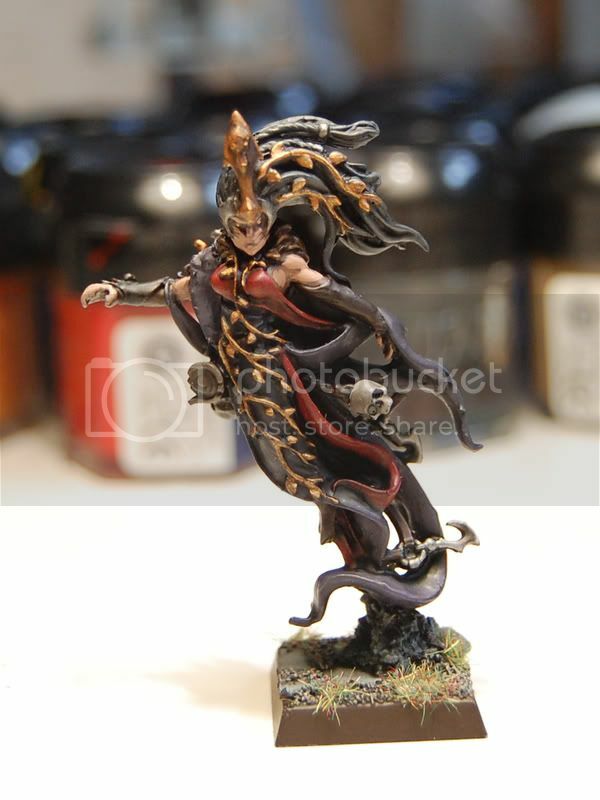 If I had bought all the models I would have spend more time painting them. I painted the armour chainmail and shining gold. Details: Deneheb stone, adeptus battle grey. 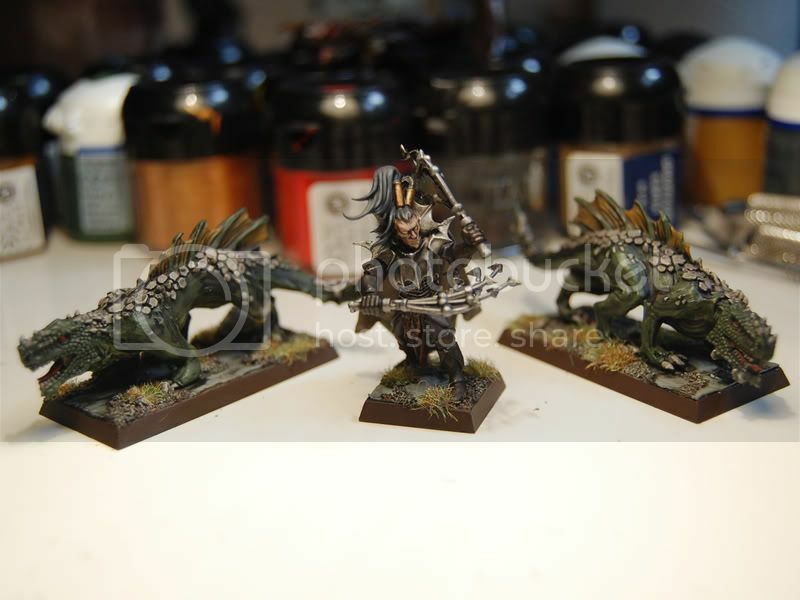 Base: Caltarn Brown for the sand and stones Astronomican grey. Then a wash of Badab Black wash. 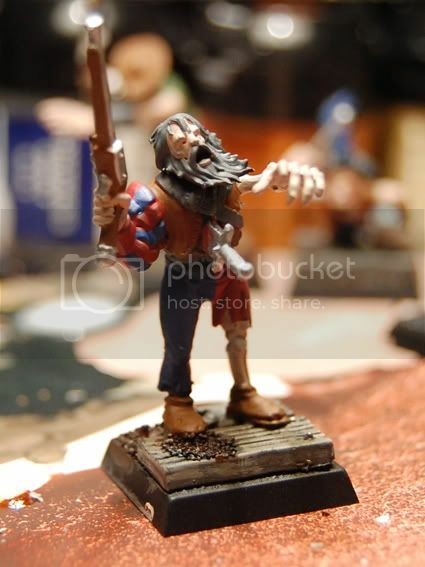 I did a smal highlight with tallarn flesh on the skin and painted teeth and eyes with bleached bone. 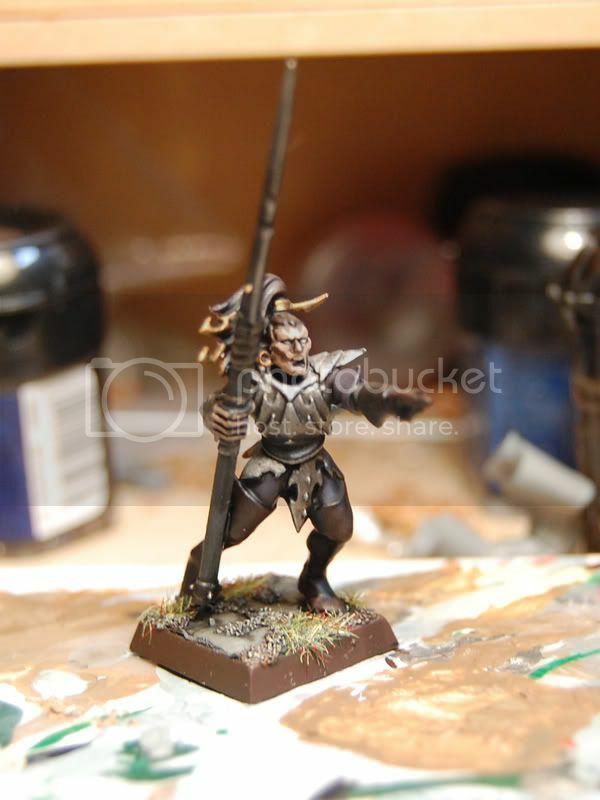 A drybrush with graveyard earth and bone on the base, and then glue some grass and your done! Fast or slow those are GREAT minis. You ARE one talented Dude! Picture time, they're done. I only did a small highlight on the face and painted some eyes. 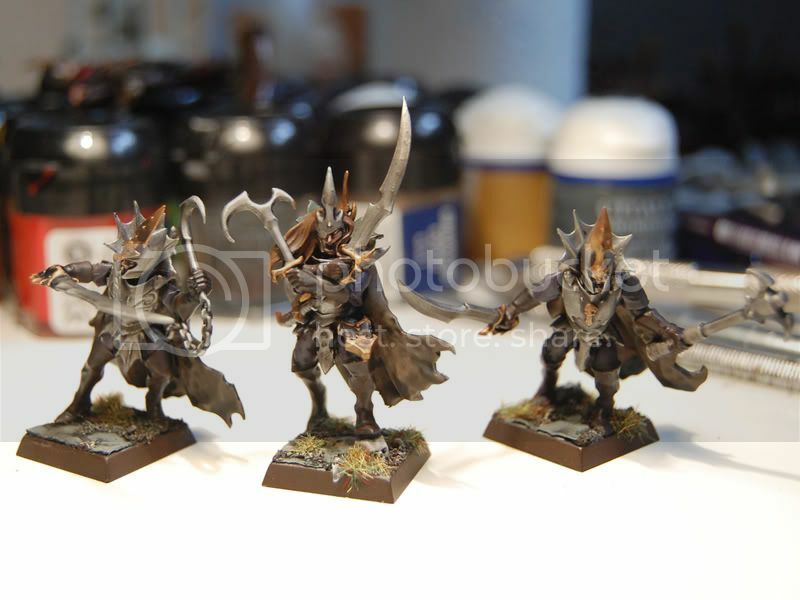 For a warband painted in a day, they look really cool, but I have to admit that washed stuff looks a little better on pictures than they actually do. 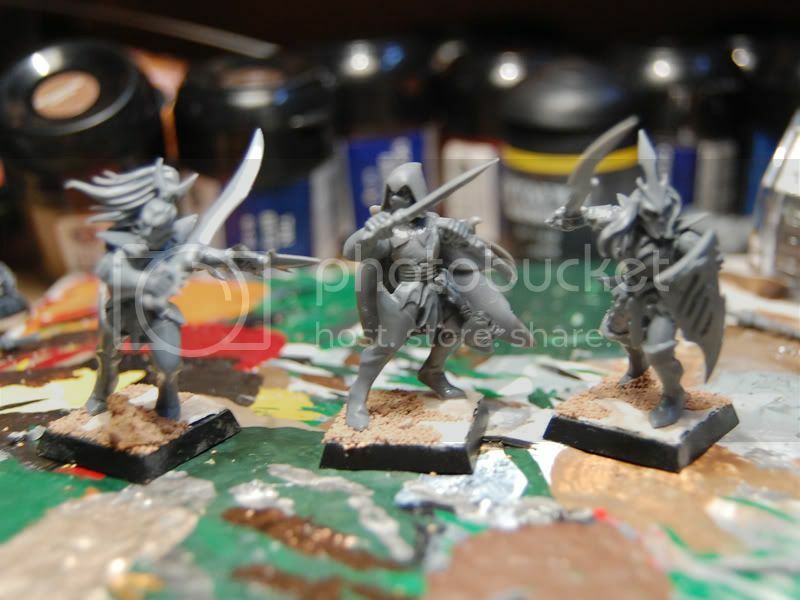 However, washed models can also be used as a base for further highlights, so it's quite a good method to field a warband nicely painted in no time, with the possibility to paint it to a great standard later. Well, done, anyways. Though I will never forgive Alwin and you bashing Matt and me up and then not even playing in the campaign anymore!!! It was a great game, though. VERY GOOD LOOKIN' Bands of Evil Elven Perverts & Nasty Sigmatite Bigots. VERY WELL & RAPIDLY DONE! Wow, those Witch Hunters look so awesome! I still don't know how you paint so well so fast, despite sitting next to you for an afternoon. And ontopic: it seems a bit self-centered of me to praise the Witch Hunters (however awesome, great, fantastic and surely invincible) and not devote words to the Druchii, who are the main subject here. They look superb. I like the look of all of them, except for the sorceress, who should be burned of course. They look superb. I like the look of all of them, except for the sorceress, who should be burned of course. Pretty cool man!!! 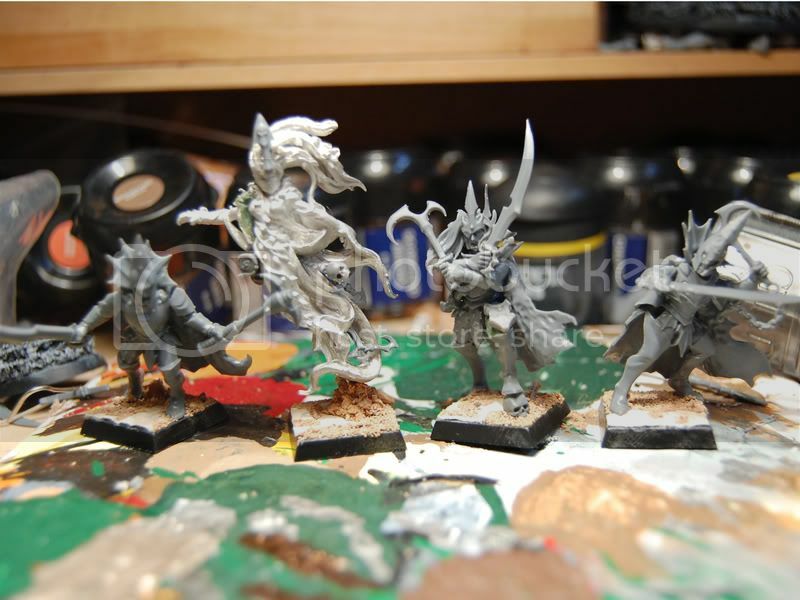 Also i love the conversions you did in some Wood Elves guys. 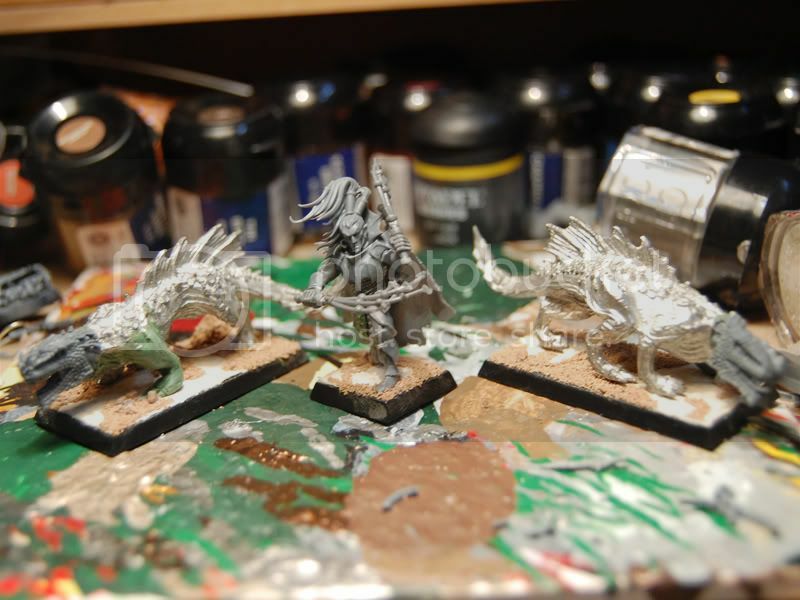 Can I just say that the Cold-one hounds are some inspired conversions sir. Truly masterful work to behold! !